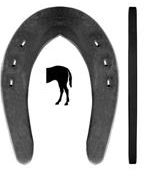 << Back Kerckhaert Sliding Plate with Tapered Heel, Pride 1-1/4 in. The shoe design pattern and nail hole placement compares to other patterns in the marketplace. However the Pride series offers cleaner and more consistent hole punching, a flatter shoe, and a more refined heel finish. Shoes are symmetrical. Punched precisely for 4-1/2 Race or 4-1/2 Race XS nails and requiring little filing to reduce the head of the nail. The ¼" x 1-¼" are punched for 6 nails.